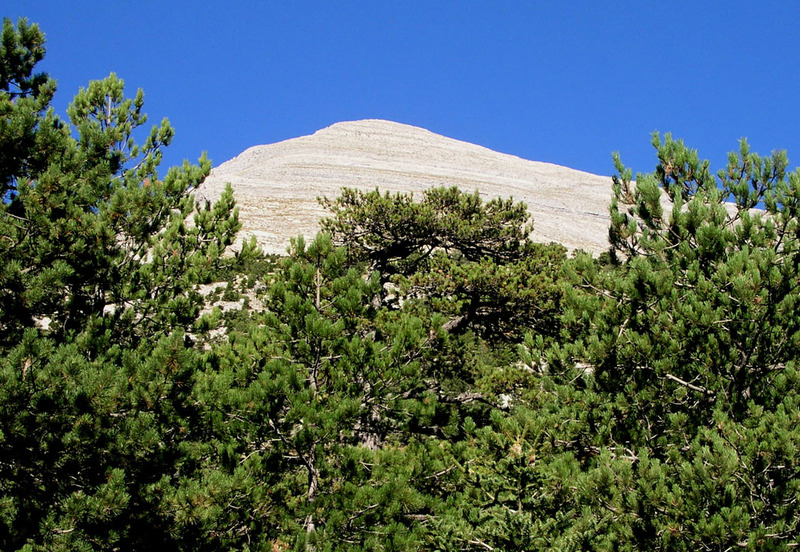 How to get there: This mountain is located next to the historic city of Spárti. The road from Athens is good, a four lane divided highway all the way to Tripoli, then a good two lane road for the last 60 kilometer. In Spárti, drive south along the main street (in the direction of Githio), a section of this street is divided with palm trees along the middle. From the end of this section, drive 7 kilometer south, then look for a road going right with a sign saying "The shelter of Taygetos 22". The location of this point is N37:00.486, E022:27.061, elevation about 196 meter. Measure from this point. After 2 km you enter the village of Anogia, at 2.9 turn left, continue straight ahead at kilometer 3.0 (do not turn right!). At 3.5 you leave Anogia and enter the next village. Continue straight at 4.1 and make a sharp right at 4.3 where there is a blue sign. At 4.5 you leave the village and head uphill. Follow the main road and make a sharp right where the road forks at km 10.2. At 13.2 you arrive at the lower trailhead. The paved road ends here. This is a good place to park and start hiking. The location of this trailhead is N36:57.949, E022:22.954, elevation 962 meter. In order to continue driving to the refuge, make a sharp left at this point and follow the road (now dirt) as it climbs the hill with several hairpin curves. At 16.8 stay left and keep right where the road forks at 17.6. At 18.2, the road gets appreciably rougher, however still very driveable with some care. At 18.5 the road passes a small mountain farm that grows trees, before arriving at the refuge at kilometer 19.7. 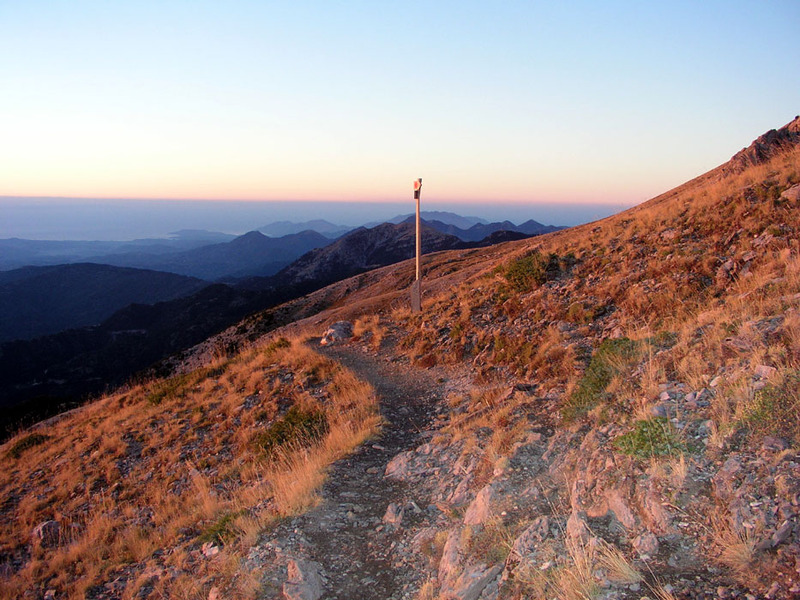 Route description: The trail from the lower trailhead is clearly marked and heads up the distinct valley to the refuge. 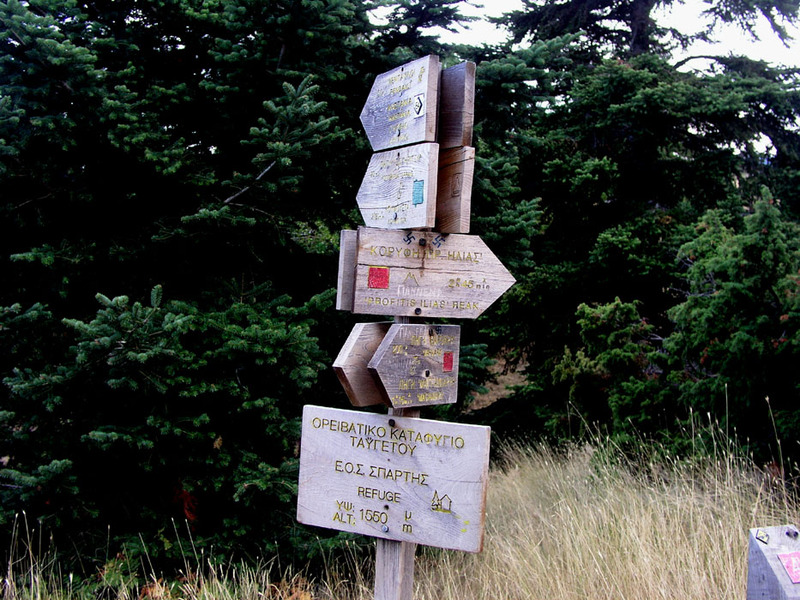 From the refuge, the trail continues from its upper left corner, there is a clear sign saying "Profitis Ilias Peak 2h 45 min". The trail is well marked with red paint and poles all the way to the summit. First, the route heads up towards the right on rock, but with good steps until reaching a somewhat more level grassy shelf. The route continues ascending in the direction of a distinct peak on the horizon that is north of the summit. 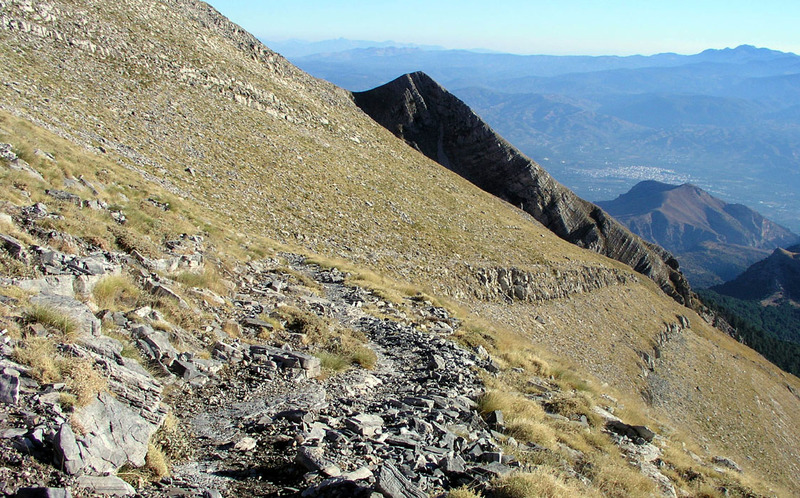 However, before getting that far, the trail turns left and ascends on top of a slanted rock band, providing a very natural path while climbing at a gentle angle. Just below the horizon ridge, the route makes a few zig-zags in order to reach an easily identifiable notch in the rock that forms the top ridge. From here, the final part of the route ascends the north ridge, staying west of the crest. Comments: My math. conference had a full day excursion to Delphi on Sunday, the temptation to climb a few more peaks as an alternative was an easy decision. This turned out to be a memorable trip on several accounts. 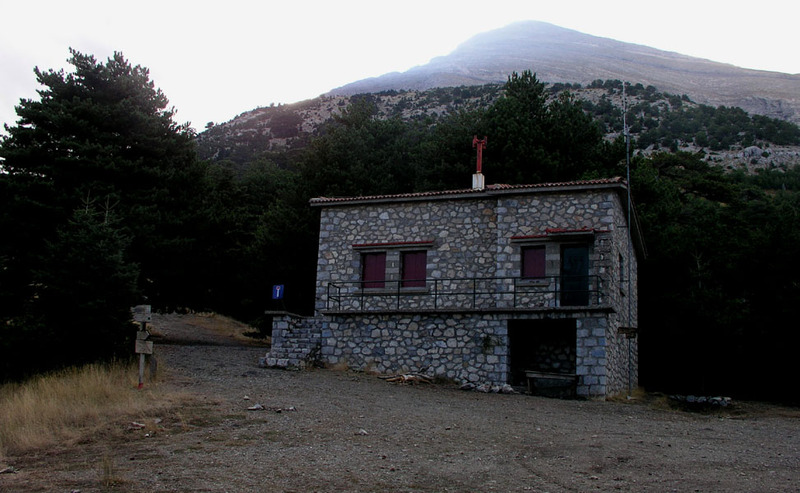 I drove from Halkida at lunchtime, the plan being to stay at the refuge for the night and hike the mountain the next morning. I discovered my mistake, located the proper mountain road and subsequently arrived at the refuge when the sun was about to set. Surprise! Here I am on a Saturday evening and there is absolutely nobody around. The refuge being securely locked with gigantic padlocks. A nice ridge extended from the refuge area out towards Spárti and the main valley below, it rose gradually to a somewhat higher point that looked as if it had an exceptionally nice view. 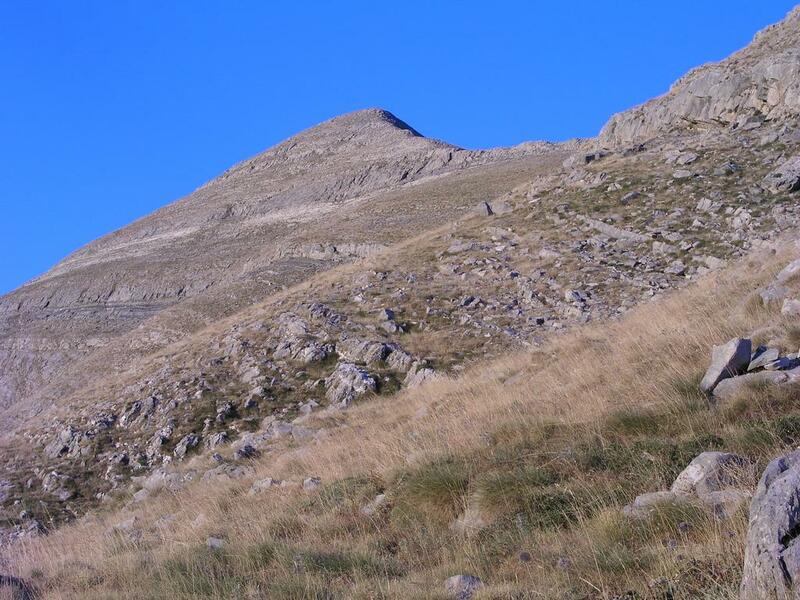 Rather than returning to the Spárta area, I decided to explore this ridgetop and just sleep under the sky there. 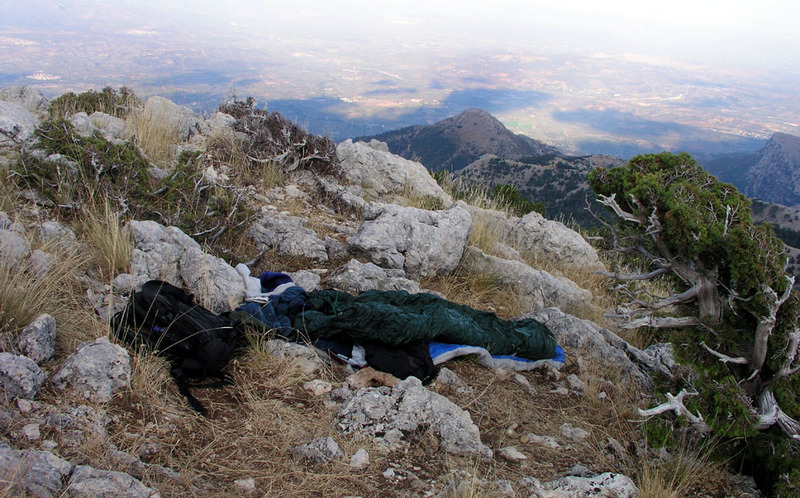 I carried my clothes and sleeping bag out and soon found what looked like the best spot to sleep. The area was full of rocks and I had no pad to sleep on, but what a fantastic view! At an elevation of almost a mile, I saw numerous villages below, more and more lights being turned on as the daylight gradually faded away. As expected, my sleep consisted of short periods of rest, disrupted by the need to move relative to the rocks below. The bonus being an almost continuous view of a clear sky with thousands of stars. One should really not sleep, but admire the beautiful universe and perhaps reflect on how small we humans are in the greater picture of endless space and time. Meteorites provided the right amount of unpredictability, suddenly streaking across the sky spectacularly silent. Gradually, Orion rose higher on the sky. My position was such that Orion ended up directly above my face. Slowly, I became aware of small signs of the coming day, first Venus, then a very thin moon started climbing on the eastern sky. I decided to have a few cookies for breakfast at 0600 and get ready to hike around 0630. I actually got underway from the refuge at 0640, which turned out to be exactly 30 minutes before sunrise this day. The day was gorgeous with the morning sun hitting the trail and reflecting in the grass, all while the peak towered above. I arrived at the summit at 0800 sharp. It was a beautiful day indeed, a great view from a very prominent mountain. I rested, had lunch and took pictures. I started heading down at 0830 and reached the refuge at 0930. 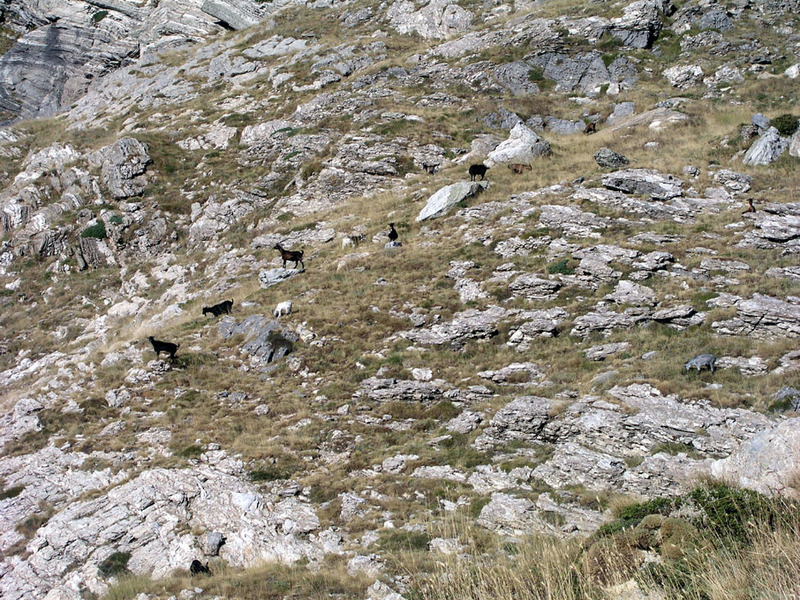 Along the way (actually quite high up) I met many goats being guarded by two dogs. The dogs did their best in warning the goats about my presence, possibly thinking that they successfully scared me away as I passed by. It occured to me that having goats/sheep guarded by dogs with no humans present might be an idea also for Norwegian farmers that always worry about their sheep. However, a mystery soon came to mind; what do the dogs eat? It seemed unlikely that they could take a goat sort of once a week. Again, besides the goats and the two dogs, not a single hiker on this large and beautiful mountain on a most sunny, clear day in September. 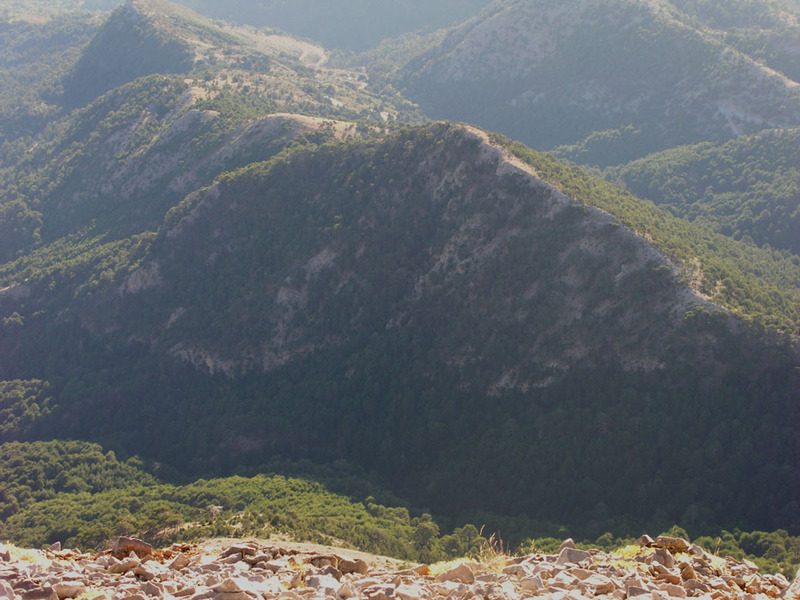 I ended up climbing six very prominent peaks ("ultras") on this trip to Greece and only met a few hikers, many of whom were foreigners, on Mount Olympos. The five other peaks showed no signs of other hikers which is a bit surprising when compared to other mountain areas in Europe. My Greek trip continued (the same day) with a climb of Killini. 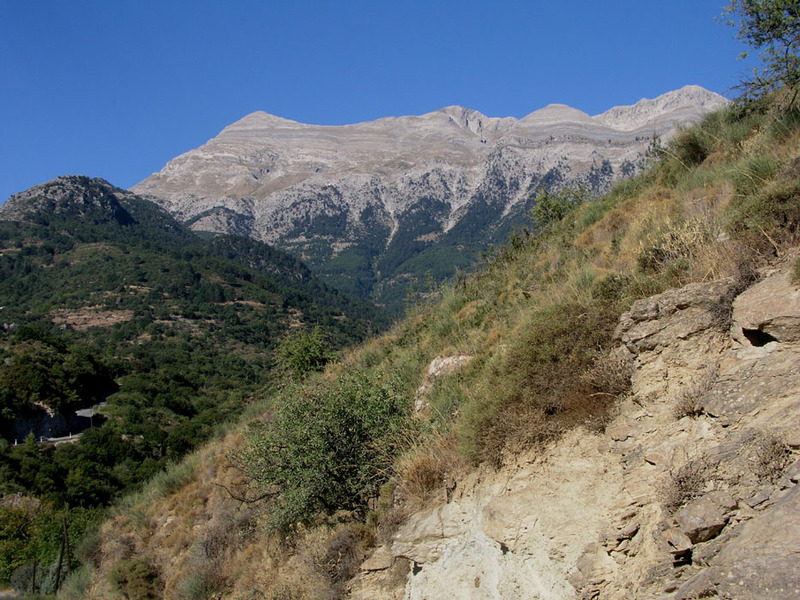 Profitis Ilias, (leftmost summit) and the mountains stretching north. This picture is taken across the big valley with the historic city of Spárti. Profitis Ilias, as seen from the slope below. Panarama view from the summit (west to north). The ridgetop that I slept on, seen from the summit. The route from the trailhead at 962 meter heads up the valley on this side of the ridge. 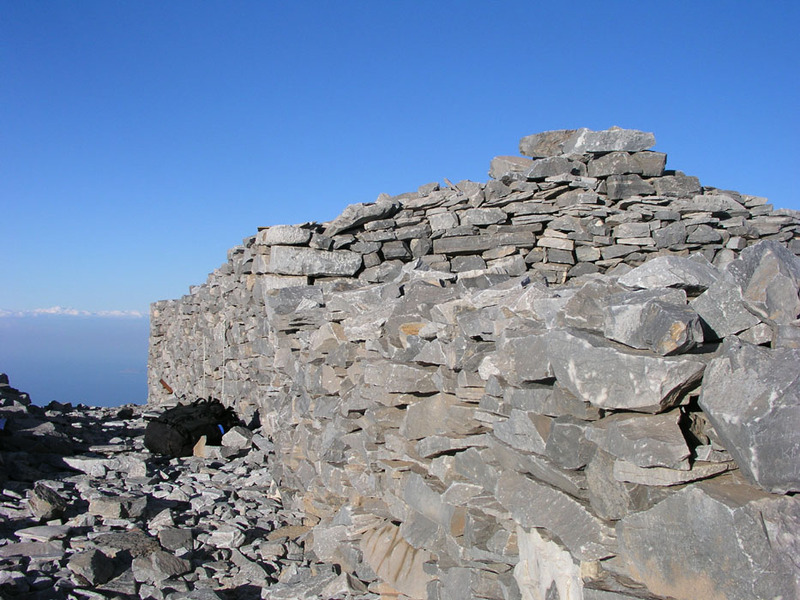 The main summit structure, there are structures like this scattered around on the summit plateau. View north. The route descends to the first saddle. The summit as seen from the refuge. 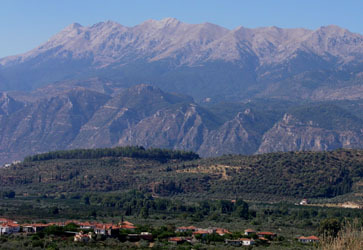 Profitis Ilias and the mountains to the north.